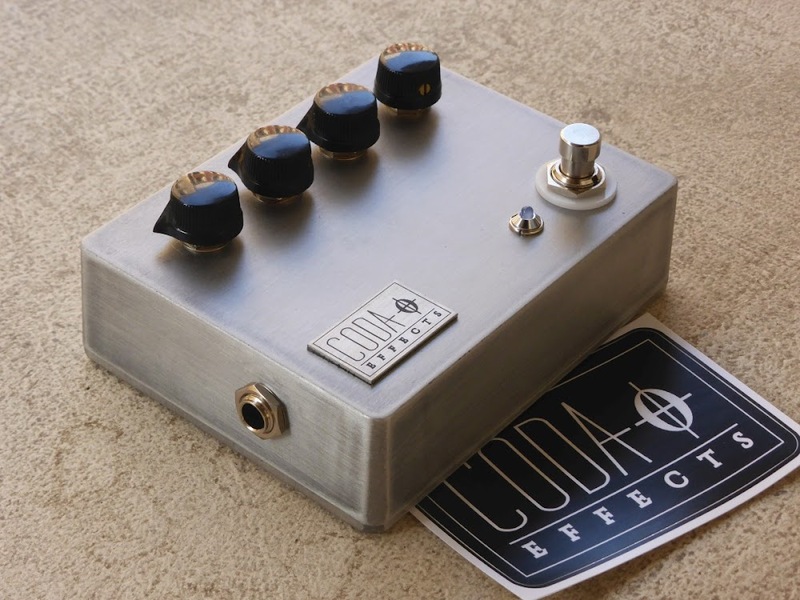 Another Big Muff clone! This time, I was inspired by the Black Keys (if you do not know this band, go check it out, it is awesome!). Dan Auerbach, the guitarist/singer, uses a lot of fuzz effects, and especially a green russian Big Muff, and a Earthquaker Devices Hoof (a Big Muff variant with some interesting modifications as we will see later). There are the 3 usual controls of a Big Muff: volume, tone, sustain, and a supplementary one: mid control! 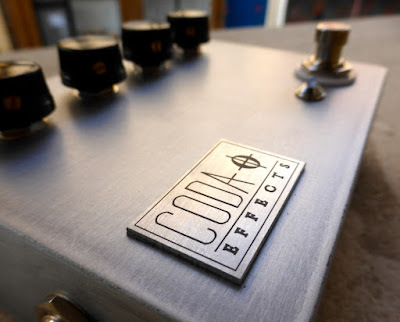 As you may know, Big Muffs can be annoying because you loose a lot of medium frequencies when you use it, which as huge downside effect: you just disappear from the mix! It can be nice sometimes when you do not want to be heard too much (when heavy riffing with a singer, or to let your other guitarist do a solo...etc). However, when you want to solo, you are doomed to be silenced by the Muff! 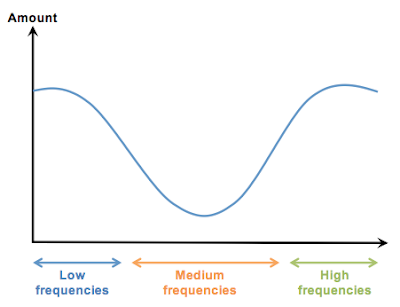 To avoid that, many muff today incorporate variants of the AMZ tone stack that allows you to have a mid control. The Hoof has such a control, and as it is very useful, I decided to incorporate it. So 4 controls Big Muff it is! I polished the enclosure with sandpaper, beginning with big one (180), and then sanding with a smaller one (480). I the varnish a bit the enclosure to avoid oxidation of the aluminium. I find the result very appealing, and it evokes my previous Big Muff build! As usual, I used the laser engraved logos I made before. 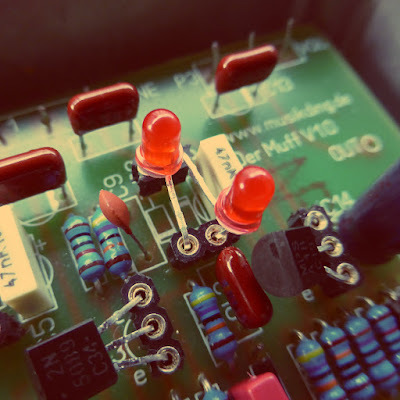 Again, I used a PCB from musikding, named "Der Muff". Honestly, this PCB is quite cheap (4.5 euros), but it is monolayer, and thus quite big. So it can only fit a 1590BB enclosure. Moreover, placement of the outputs / ground / battery.... pads is not optimal, and there is a lot of unused space on the board. I am currently designing a PCB that I will use for my next builds. I am planning to make it fit a 1590B enclosure instead. I mixed a russian green muff with the Hoof and Ram's Head values to have something nice. I used Panasonic SMF capacitors, and 2n5089 transistor (and a MPSA18 for the output transistor, which gives a high volume output). For the tonestack, I used the exact same values as the AMZ tonestack circuit. I tried to use germanium transistors (AC187) for the clipping section, like in the Hoof, but I was not really satisfied with the result. You loose a lot of output volume (due to the low hfe of germanium transistors, but you can bias the transistors differently to get the volume back), and the result is not really different from a classic Muff. 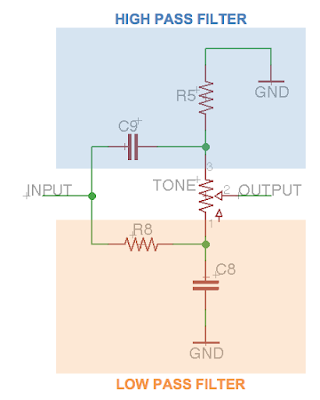 It makes sense because in the Muff circuit, transistors are not supposed to saturate, and the difference between silicon and transistor is not really obvious when only amplifying a signal. You can see that, instead of the classic 1n914 diodes, there are LEDs on the board... Actually, LEDs are diodes, and can be used for clipping! They have a voltage drop of nearly 1.6V (for Red LEDs), which is a lot compared to silicon (0.6V) or germanium (0.35V) diodes! Actually, it is really nice sounding a Big Muff, the sound is brighter and less compressed, it really gives a breath to the Muff, which is less compressed, and more overdrive sounding, especially when turning the mid knob up! Voltage drop changes depending on the color of the LED. Red diodes have the lower voltage drop, and blue ones for instace have a huge one (2.8V!). The sound is really different when you swap for blue LEDs, in fact the transistors started to saturate, and the muff was sounding much more mushy, not really a nice compressed and saturated Big Muff sound... Red LEDs are better. Well, I am sorry again, I really need to buy some stuff to properly record my pedals - but no-money-effect - I cannot, so you will have to believe me again... First, it sounds really closer to the Hoof than a Green Muff. I think this is mainly because of the LED clipping diodes. It gives a really nice touch to the sound of this Muff, it is less compressed, less saturated, but still quite heavy. I really like it! It gives also more versatility to the Big Muff, if you roll back the Sustain knob, and increase the Mids, you really have something that sounds close to an overdrive, really interesting! I think I now completely understand why the Hoof was a success! Funny thing: if you replace the LED by classic 1n914 silicon diodes, you get back to a classic green muff sound! I do not know why anybody did not make a switch for the clipping diodes already! 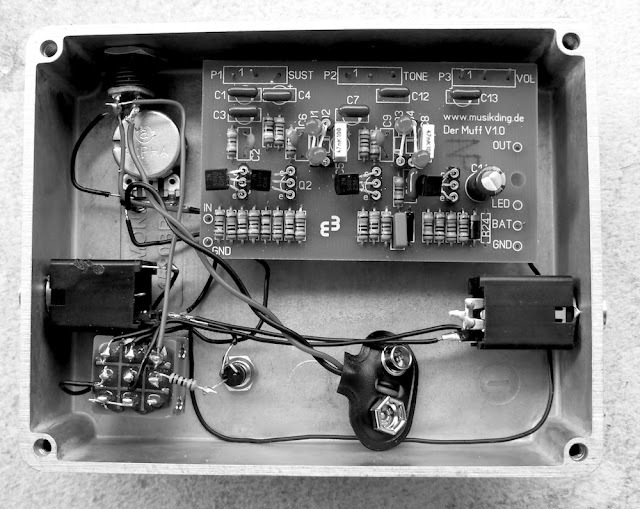 I think I will try to do something like this for my next Big Muff clone. However, I am a bit disappointed by the AMZ tonestack. Evenif the Mids knob works really really well, the tone knob is weird. I guess it is because of the logarithmic scale, but you do not have that much variation when turning it, and suddendly everything becomes trebly and agressive... I will try a classic linear knob next time, or maybe tweak a bit the values because I am not really satisfied with it now. Overall, it is a really nice sounding device, and you can get many different sounds, from a more overdrivy sound to classic muff sounds when dialing with low mids and high sustain. Great thing for sure! I advise you to read the Big Muff circuit analysis first. Here we are going to see in detail a very important part of the Big Muff circuit: the tonestack. The tonestack is a small part of the circuit, with 5 components,, that allows you to set the tone of the saturated signal, the amount of bass and trebles. One of the characteristics of this tonestack is that it scoops the mids of your tone. It gives you a heavy, powerful tone. However, the huge downside to it is that when playing in a band, you can easily disappear in the mix. Indeed, the low frequencies are covered by the bass guitar, and the drums are really loud in the high frequencies... Sometimes, it is like your guitar has been muted! 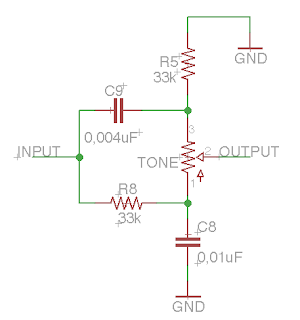 It is composed of two passive RC filters, a high pass and a low pass filter. 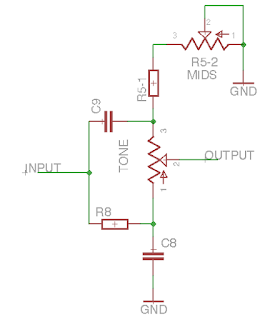 The tone potentiometer mixes the two filters to let more or less bass / treble going through. OK so we can have different mids scoop depending on the value of the components... But is there a way to dose the mid scoop with a knob? Yes! AMZ fx had the really great idea of using a resistor plus a potentiometer for R5. 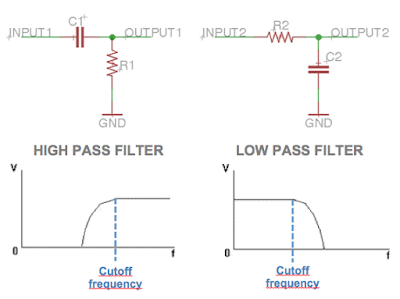 Thus, you can modulate the cutoff frequency of the high pass filter. 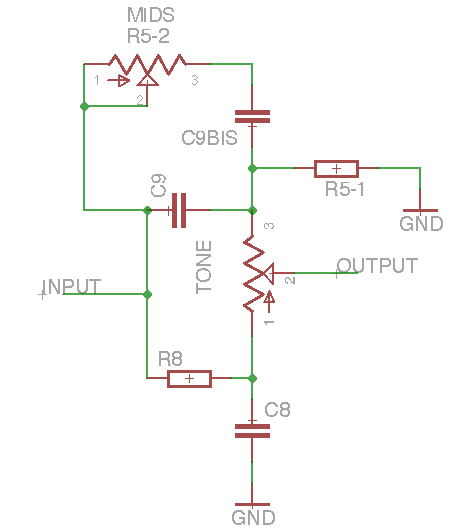 If you diminish the value of the resistor, the cutoff frequency will be lower, and thus you will get more mids. Have fun experimenting! You liked this post? 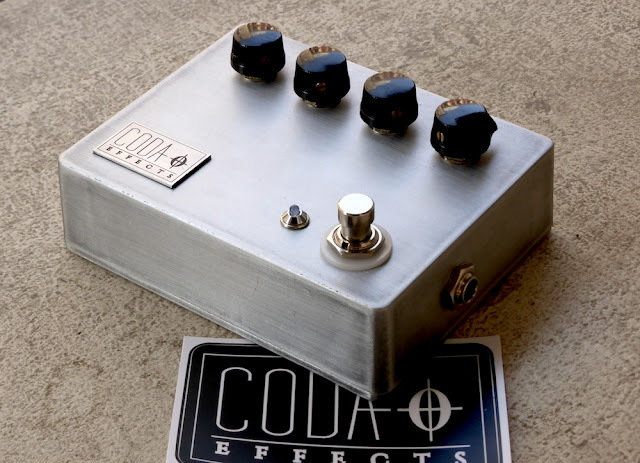 Thank me by liking Coda Effect's Facebook page! Hi, nice article.All good relevant info in one page.